This guide attempts to answer the question of what is the best wide angle lens for your Nikon or Canon dSLR. 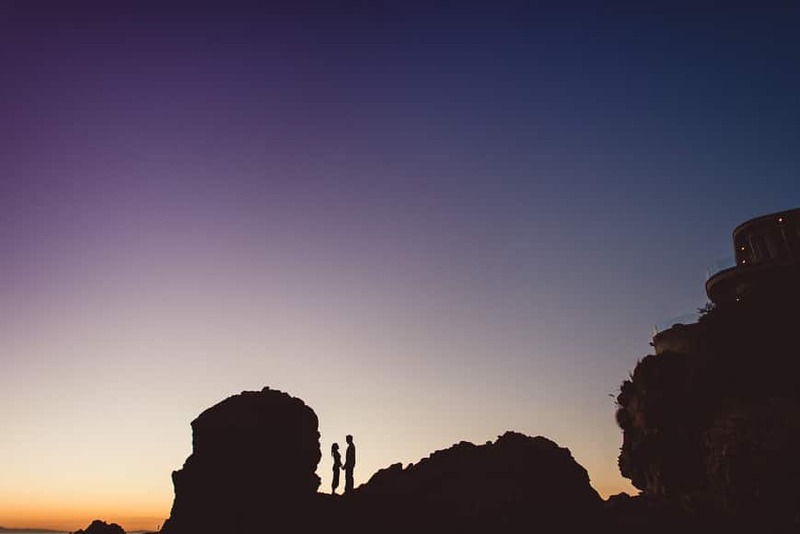 Whilst a staple in the camera bags of arhitecture, landscape and interior photographers, the wide angle lens is also immensely popular amongst photojournalism, wedding, sports, and even portrait photographers. 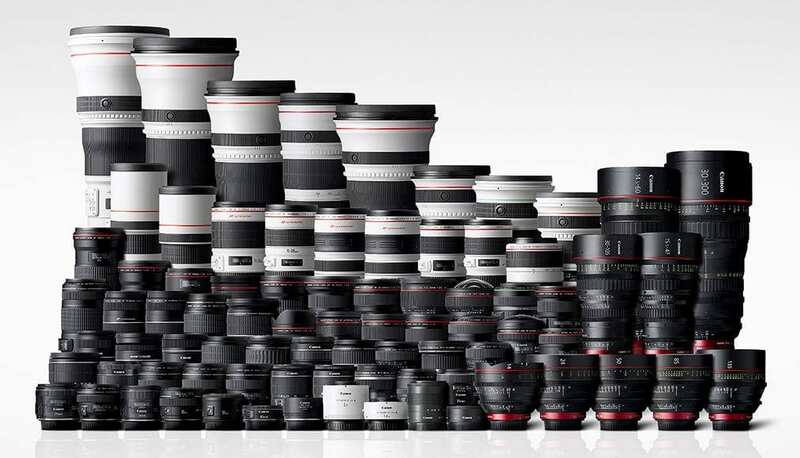 All camera lens manufacturers offer several choices of wide-angle lens. At last count, there were over 20 Canon wide angle lens options and over 25 Nikon wide angle lens options, with both zooms and fixed lenses falling into this wide angle lens category. In this post I’ll be introducing wide angle lenses for those unfamiliar with their benefits, then I’ll take a look at the best wide angle lens for Nikon cameras, the best wide angle lens for Canon cameras, and finally the best wide angle lens made by third party manufacturers. [See here for the best Fuji lenses including some wide angle lens recommendations]. On a full frame camera, a wide angle lens is considered any focal length equal to or wider than 35mm. That’s right – even the hugely popular 35mm lens you leave on your camera 90% of the time is considered a wide angle lens. From 24mm and wider, we’re entering ultra-wide angle lens territory. It should also be noted that the difference in your camera’s sensor size will affect any given lens’s actual focal length. A 35mm lens on a full frame camera (one with a 35mm sensor) will offer a true 35mm field of view, whereas the same lens attached to a crop sensor camera (APS-C, MFT) would offer an approximate 50mm field of view i.e. it would no longer be considered a wide angle lens. This means that for those of you shooting with APS-C, MFT or any other crop sensor camera, you’ll need to experiment with much wider focal lengths to achieve a true wide angle lens look to your shots. I fully appreciate that full frame cameras aren’t available or even necessary for a large portion of Shotkit’s readers which is why i’ve included a handful of good wide angle lens options for anyone shooting with a crop sensor camera. What are the Benefits of a Wide Angle Lens? The most obvious use for a wide angle lens is to include more of the scene in your photograph. 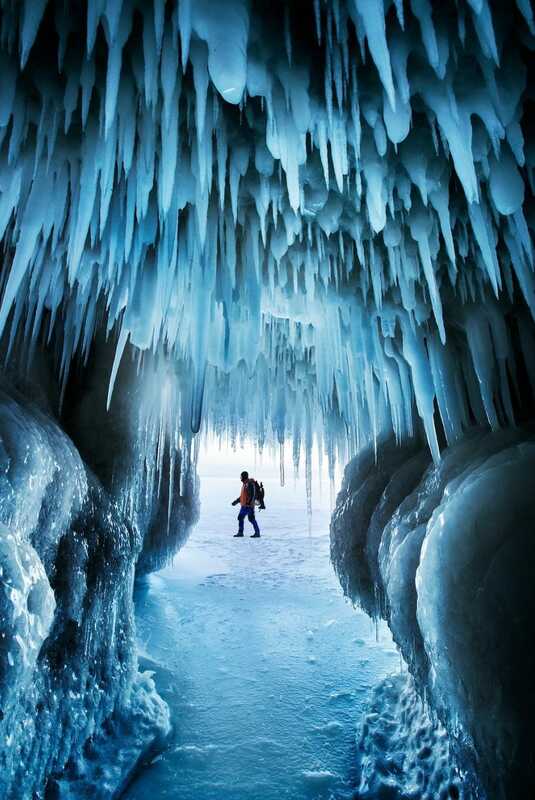 In some situations, you aren’t able to simply step back a few paces to include more into your camera’s frame. One example of this is interior photography, with the walls of a house obviously imposing a physical limit to your movement. Allowing more into your frame with a wide angle lens can also be a powerful story-telling technique, giving you the ability to introduce multiple elements into one photo to convey a fuller story of the scene. 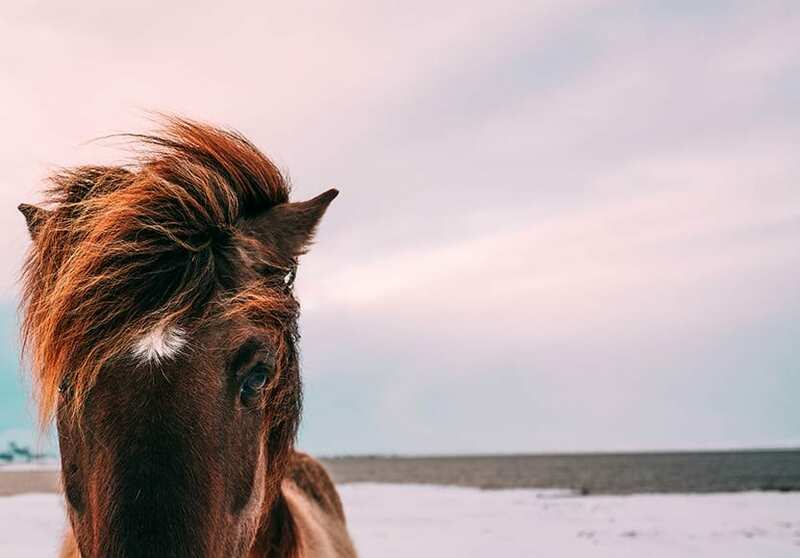 The width of the frame that a wide angle lens allows you to capture can be beneficial when you wish to be close to your subject, but still capture enough of the background in the image to set the scene. 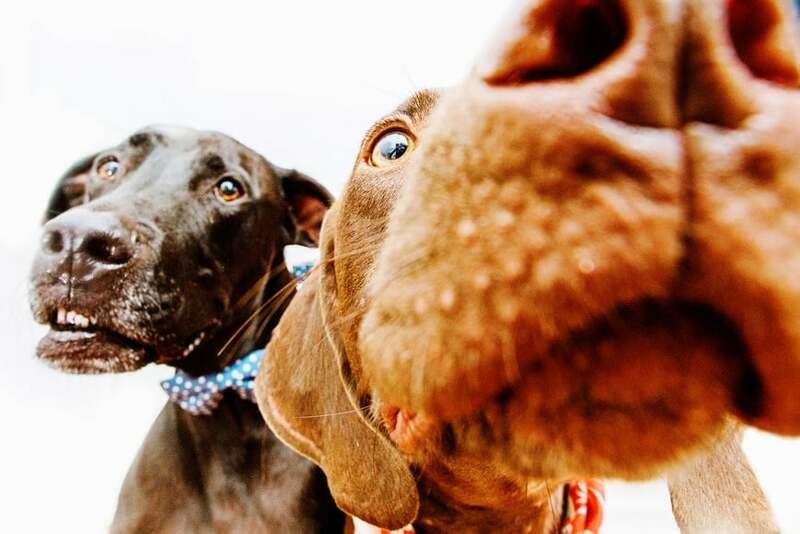 Fitting more into your photo isn’t the only usage of a wide angle lens. A wide angle lens can also be used creatively to exaggerate or emphasise the difference in size, or the distance between objects in the foreground and background. Whilst a zoom lens compresses a foreground and background object making them appear closer, a wide angle lens does the opposite. Wide angle lenses also introduce an element of distortion to a picture. Whilst distortion may be something you want to avoid, it can also be used creatively to add impact to an image. 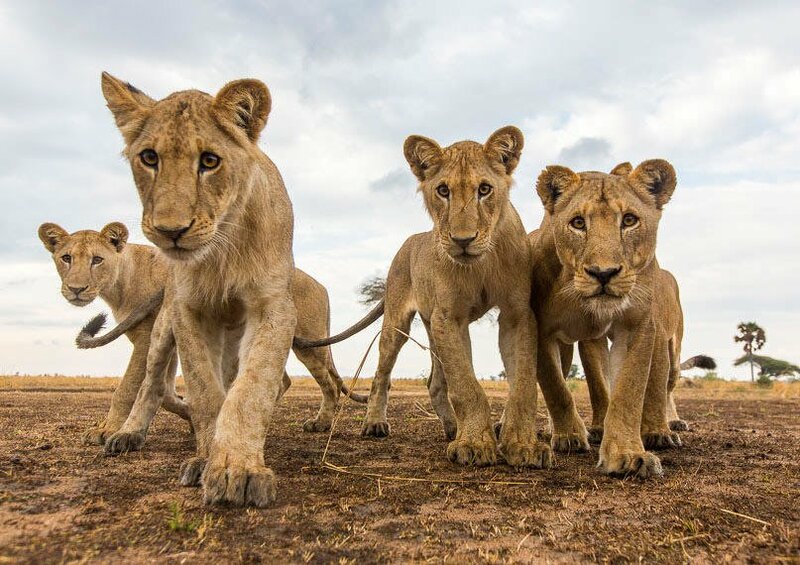 A wide angle lens can often allow you to focus much closer to your subject, bringing with it the ability to play with a subject’s scale and other creative options. Another benefit of a wide angle lens that isn’t often talked about is the ability to shoot handheld at slower shutter speeds. 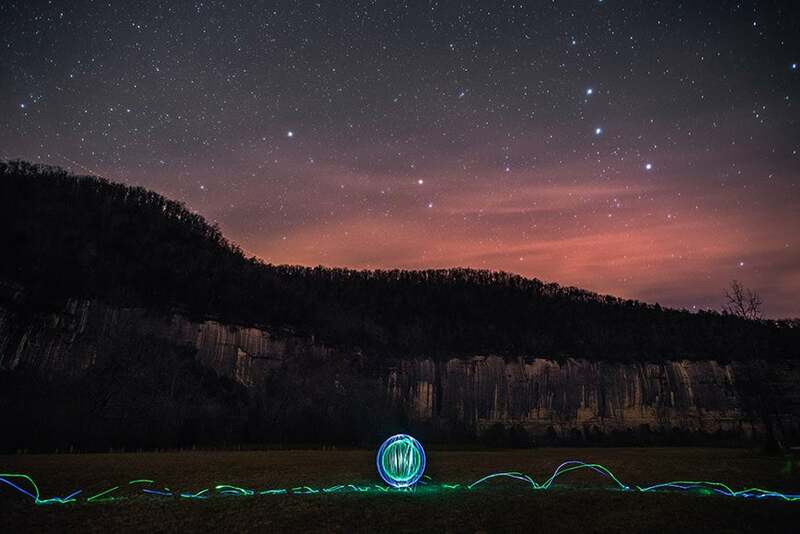 This can result in a cleaner image in low light, since you can compensate for a lower ISO with a slower shutter speed to get the exposure you want. As an example, you’d be able to hand-hold a camera with the Sigma 24mm f/1.4 attached for exposures twice as long as the Sigma 50mm f/1,4 (since it has half the focal length of a 50mm lens). Nikon offers an impressive array of 19 prime wide angle lens options for the Nikon FX (full frame) and DX (APS-C or crop sensor) dSLR cameras. As for wide angle zoom lens options, there are 5 whose entire focal range is considered wide angle, and others that incorporate a wide-telephoto zoom such as the incredible Nikon 24-70mm f/2.8 (one of the most impressive zoom lenses I’ve ever used). As you’ve probably guessed, there’s no single best wide angle lens for Nikon cameras, but rather several wide angle lenses whose performance is stellar, and can be found in the camera bags of numerous photographers featured on Shotkit. Let’s have a closer look at what model is widely regarded as the best wide angle lens for Nikon dSLR cameras. It’s big… it’s heavy… it’s expensive… but the Nikon 24mm f/1.4G is also often touted as the world’s best wide angle lens. It’s most definitely the best Nikon wide angle lens for prime shooters, and has been since its release in 2010. The Nikon 24mm f/1.4G works fine on a DX (crop sensor) Nikon camera, where it’s focal length is roughly 36mm. If you own a consumer level Nikon DX camera and are planning to upgrade to a full frame body in the future, the Nikon 24mm f/1.4G could be a worthwhile investment. However, it’s on a full frame Nikon body that the Nikon 24mm f/1.4G really sings. It’s bright, sharp and contrasty at every aperture from edge to edge, with minimal distortion. Combining the large aperture with the 24mm focal length allows you to shoot hand held at much slower shutter speeds than you may be used to, meaning you have the option to drop the ISO for a cleaner file. Bokeh on the Nikon 24mm f/1.4G is smooth and creamy, but it should be remembered that to get decent subject separation via in/out of focus elements with a wide angle lens (even at f/1,4), you’ll need to focus on a close subject to allow the background some room to fall out of focus. Shot wide open at f/1.4, the Nikon 24mm f/1.4G is impressively sharp, all the way from the centre of the image to the corners. 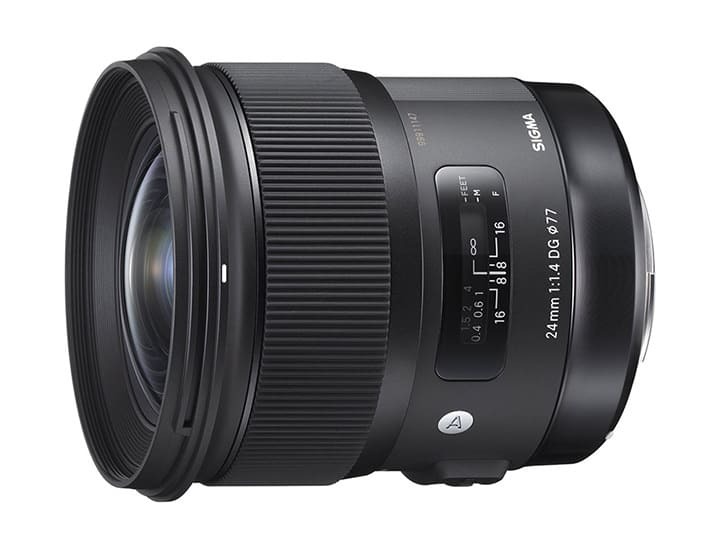 Sigma offers a Sigma 24mm f/1.4 ART lens at half the price of the Nikon 24mm f/1.4G, and whilst the Sigma’s performance is excellent, the edges of the frame are noticeably less sharp than with the Nikon wide angle lens. If you’re an architecture or landscape photographer who needs tack sharp images from edge to edge, the Nikon 24mm f/1.4G is still the best wide angle lens option. For more examples of the many ways photographers on Shotkit are using this versatile lens, use the ‘Browse Shotkit By’ drop down filter on the right of this post, or click here. The Nikon 20mm f/1.8G deserves it’s spot in the best wide angle lens for Nikon lineup, since it’s currently Nikon’s sharpest fixed ultra-wide angle lens. Aside from the amazing performance of the Nikon 20mm f/1.8G, it’s almost half the weight of the Nikon 24mm f/1.4G and over half the price too! Whilst you’ll no doubt be shooting a lot wide open with this lens, stopping down to the smaller apertures really shows off the incredible sharpness of the Nikon 20mm f/1.8G. 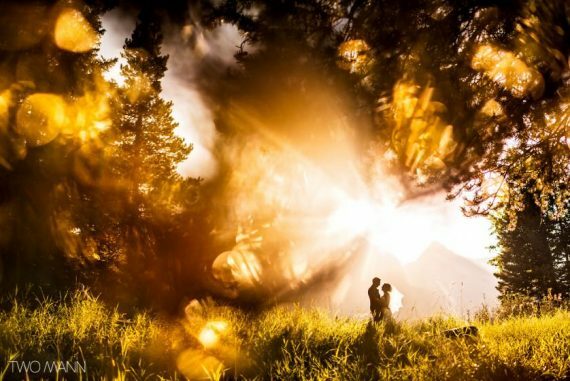 As an added bonus, smaller apertures introduce some impresssive sun stars to your image – something that’s rare on the more modern Nikon lenses. Thanks in part to its light weight, the auto focus on the Nikon 20mm f/1.8G is fast and accurate. It also handles chromatic aberrations, distortion, ghosting and flare very well. 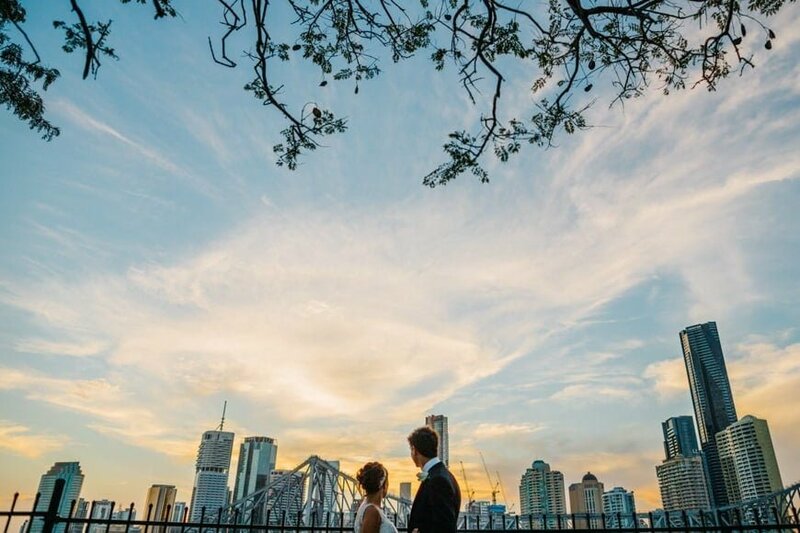 The Nikon 20mm f/1.8G is a firm favourite for astrophotography, but is equally popular for wedding photographers who want an ultra wide angle Nikon lens for that odd group shot featuring 200 guests! When used on a DX format (crop sensor) Nikon camera, the Nikon 20mm f/1.8G offers a 30mm field of view, which means it remains in the wide angle lens category. The size and weight of the Nikon 20mm f/1.8G actually suits Nikon’s DX cameras such as the Nikon D500 very well, ensuring that the lighter DX camera body is well-balanced with the lens. I’m a big fan of Nikon’s recent f/1.8 G lens releases and recommend them to any photographer looking for a great value, great performing prime lens. 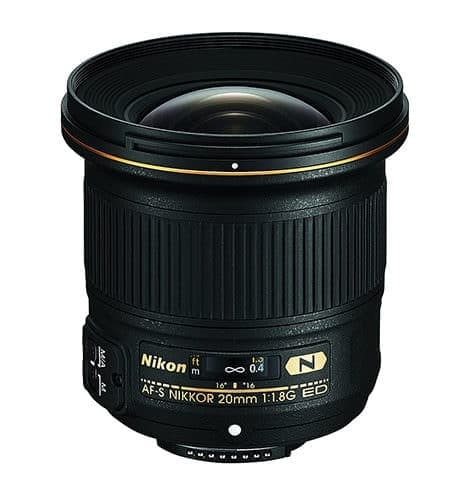 If you’re in the market for a great all-round Nikon ultra wide angle lens, the Nikon 20mm f/1.8G should be at the top of your list. This is quite simply the best ultra wide angle zoom lens for Nikon DX cameras. The Nikon 10-24mm f/3.5-4.5 offers a dramatic 61-110 degree picture angle, making it the perfect wide angle lens for landscape photography, interior photography, architecture photography and more. As long as you place your subject wisely, you can even use the Nikon 10-24mm f/3.5-4.5 for dramatic environmental portraiture with no distortion. In practice on a Nikon D7200, I found the 10-24mm focal length very useful for wide angle photography. Once you’ve been using 24mm for a while, it doesn’t seem so wide angle any more, so it’s nice to be able to twist the lens and turn your viewpoint to 10mm, bringing in the entire vista in front of you. 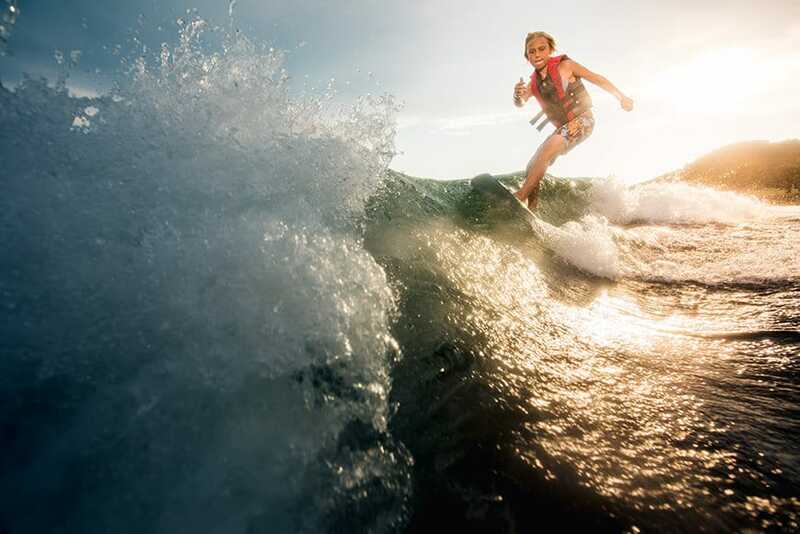 The Nikon 10-24mm f/3.5-4.5 is sharp and focuses quickly. Obviously with a lens this wide, you’ll need to expect a fair bit of barrel distortion at 10mm. 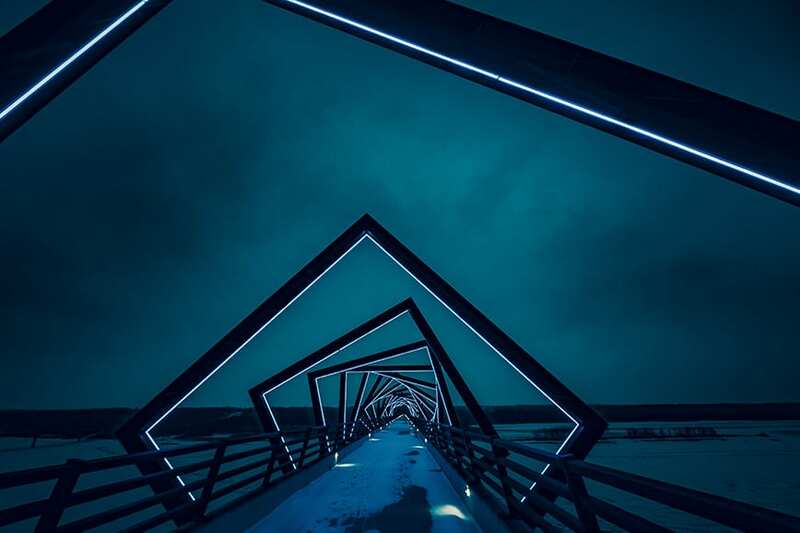 As long as you don’t place straight lines near the edges of your frame or focus too close to your subject, you can still get an image that doesn’t look warped. Lens distortion is actually corrected to some extent in all modern Nikon dSLR cameras, so what you’ll be viewing in your photos is actually an image with the correction applied. One click of the ‘Enable Profile Corrections’ button in Lightroom and the rest of the distortion is usually fixed too. The Nikon 10-24mm f/3.5-4.5 feels a little plasticky compared to some of the more expensive wide angle lenses in this review. However, as long as you look after the lens, it’ll still last a long time. Also, having it made out of plastic reduces its weight considerably… not to mention its price. There’s also a Nikon 12-24mm wide angle lens which is a similar weight/price, but I’d still recommend the Nikon 10-24mm f/3.5-4.5. If you’re going to go ultra-wide, you may as well get the widest version, especially on a DX camera which is already reducing the ‘wideness’. An alternative for a little less money is the excellent Tokina 11-16mm f/2.8 Pro DX II, which is actually better built (not to mention faster) than the Nikon. However, I still stick to my recommendation of the Nikon 10-24mm f/3.5-4.5 on this best wide angle lens roundup. The focal range in my opinion is more useful than 11-16 (which seems a little short), plus the Nikon is sharper wide open, and becomes even sharper when stopped down to f/5.6-8. 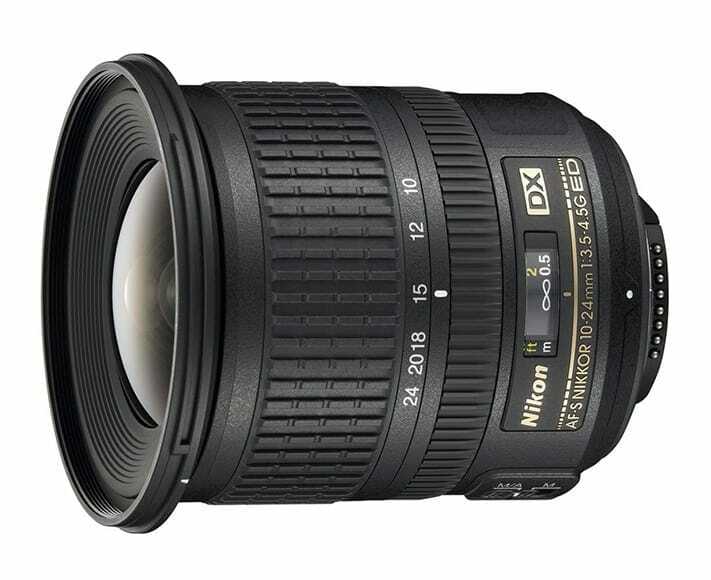 With over 170 raving customer reviews for this lens on Amazon, if you’re looking for an ultra-wide angle lens for your DX format Nikon dSLR, the Nikon 10-24mm f/3.5-4.5 really is hard to beat. I was in two minds about including the Nikon 14-24mm f/2.8G in this roundup of best wide angle lens offerings. Despite having over 200 positive reviews on Amazon and legions of devoted fans, this Nikon wide angle lens really polarises opinion. I’ve heard many stories about how photographers swear by their Nikon 14-24mm f/2.8G wide angle lens to give a look that’s unparalleled to any other wide angle lens on offer by any manufacturer. On the other hand, I’ve heard just as many stories of photographers selling their Nikon 14-24mm f/2.8G after a few weeks of use. One thing all users agree upon though is that the Nikon 14-24mm f/2.8G is an incredible wide angle lens. It’s just whether it’s right for you or not. 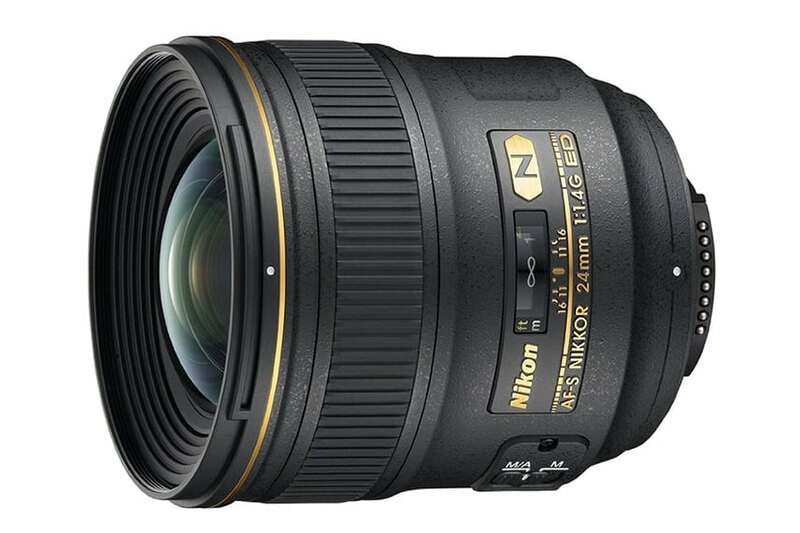 Let’s get one thing straight – the Nikon 14-24mm f/2.8G is one big, fat, heavy and inconvenient lens! In order to achieve such incredible image quality at an extreme wide angle, the front of the lens on the Nikon 14-24mm f/2.8G is rounded. This means that you won’t be able to use any screw-in front filters on it, which rules out a lot of landscape photographers and their favourite ND filters. The Nikon 14-24mm f/2.8G is actually compatible on DX cameras but I wouldn’t recommend this usage, since the lens itself is likely to be much heavier than the camera. It’s on an FX Nikon dSLR camera that this ultra-wide angle lens really amazes, with edge-to-edge sharpness even at 14mm – no other wide angle lens in the Nikon line up can achieve such a feat. It’s arguably the sharpest ultra wide angle zoom lens of any manufacturer too. There’s also next to no ghosting or darkening in the corners of the frame which is unusual for an ultra wide angle lens. This combined with the sharpness makes the Nikon 14-24mm f/2.8G a firm favourite with architecture and interior photographers who need the cleanest files from edge to edge at any given aperture. The Nikon 14-24mm f/2.8G can also be used for great dramatic effect for portraiture when distortion is used to exaggerate the size of the subject. One example is in pet photography, where a the animal can look huge in the centre of frame, whilst still showing enough background behind it to tell the story. Nikon offers several fixed ultra wide angle lens options which are undoubtedly lighter and more wieldy to use, but the Nikon 14-24mm f/2.8G has replaced them all with an all-in-one package. If you’re looking for a Nikon wide angle lens that gives you an extreme point of view with the sharpest image, you’ll just have to put up with the shortcomings of the Nikon 14-24mm f/2.8G because it really is the best there is. As I said at the start of this review, the Nikon 14-24mm f/2.8G is big, heavy and expensive, but for some photographers it’s by far the favourite lens in their camera bag. It’s a speciality camera lens to be used in the right circumstances for the right kind of photographer. 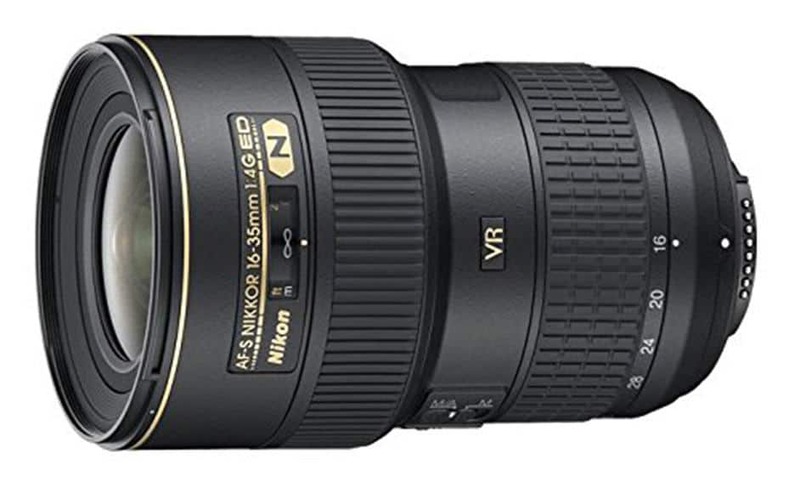 The Nikon 16-35mm f/4 VR is a hugely popular Nikon wide angle lens, and is a more versatile option for photographers than the formerly mentioned Nikon 14-24mm f./2,8D. Aside from being another razor-sharp ultra wide angle lens for Nikon, the major drawcard of the Nikon 16-35mm f/4 VR is the addition of optical image stabilisation (VR = Vibration Reduction). In fact, this is the first wide zoom to offer inbuilt optical stabilisation, allowing you to do things not previously possible with a wide angle lens. Compatible with both FX and DX Nikon cameras, the Nikon 16-35mm f/4 VR offers a practical and usable focal range that’s suited to a wide range of photographers. Often with wide angle zoom lenses, you’ll find you’ll only shoot at it’s widest angle, but with this lens, that’s not the case – 35mm is a classic focal length which provides versatility for almost every situation. It’s at the 16mm end of the focal range though that you’ll be purchasing this lens for, and fortunately, it performs very well indeed. 16mm is considered ultra-wide angle, and the first time you look through the viewfinder, the field of view is almost dizzying! Obviously f/4 isn’t great for lowlight situations, despite the impressive image stabilisation functionality of this lens. However, if you’re shooting in good light or on a tripod in lowlight (as most landscape/architecture photographers will be doing), the Nikon 16-35mm f/4 VR is a great value wide angle lens. 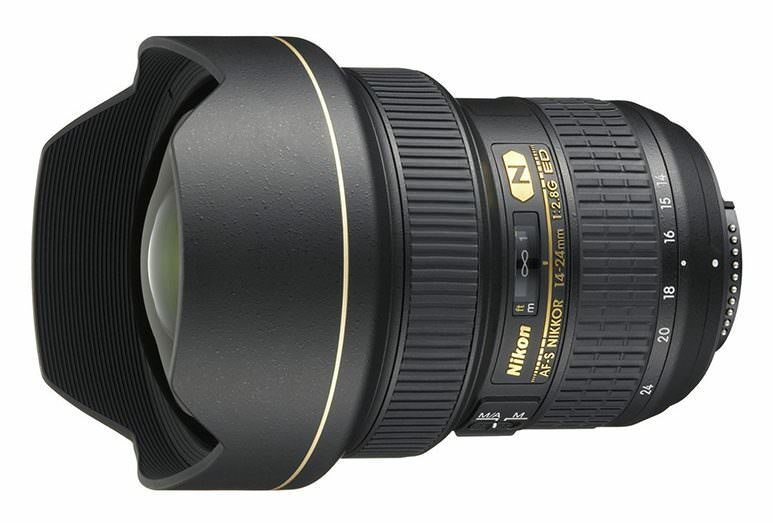 The Nikon 16-35mm f/4 VR is ultra sharp, and focus is fast and accurate. At 16mm you should expect some healthy distortion, but it’s fixable with one click in Lightroom as usual. The Nikon 16-35mm f/4 VR also allows the use of front-mounted filters (unlike the aforementioned 14-24mm wide angle lens), making it a firm favourite for those wishing to shoot wide angle long exposure shots in moderate light. If you absolutely need to shoot in low light, nothing can touch a fast wide angle lens like the Nikon 24mm f/1.4G, but if you’re going to be shooting in decent light, the Nikon 16-35mm f/4 VR is a useful and impressive lens. As for Canon wide angle lenses, Canon currently offers 13 wide and ultra-wide EF and EF-S prime lenses for its full frame and APS-C (cropped sensor) dSLRs. There are also seven wide angle zoom lenses in the series, bringing the grand total to 20 Canon wide angle lens options for photographers. Canon even offers an extreme wide angle lens focal length for users wanting to include 180 degrees of the scene in front of them with the crazy Canon 8-15mm f/4 Fisheye USM, which can be used on both full frame and APS-C to achieve the warped fisheye look. Whilst a fisheye lens is certainly niche, other wide angle Canon lenses are extremely popular, finding a place in many of the photographers’ camera bags here on Shotkit. This Canon wide angle lens is big, heavy and expensive… but consistently named as the most popular Canon wide angle zoom lens available today. The Canon 16-35mm f/2.8 L II replaces the first version of this classic Canon wide angle lens, bringing with it a sharper image when shot wide open at f/2.8, which is where the majority of its users will no doubt be shooting. If you’re a landscape shooter who has little need for a fast lens, save some money and go with the original Canon 16-35mm f/2.8L which actually has better sharpness from f/4 to f/16. 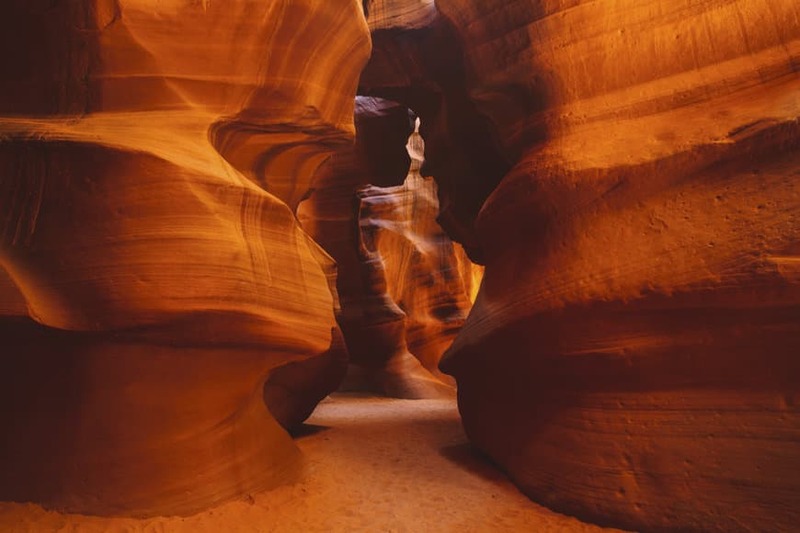 You may also be interested in these landscape photography tips. However, sharpness isn’t everything, especially when it comes to wide angle lenses. Due to the curvature of the lens in order to achieve ultra-wide angles, corner sharpness is usually an area where wide angle lenses struggle. Fans of the Canon 16-35mm f/2.8 L II love the useful and convenient focal range, allowing you to go from an extreme wide angle shot to a more classic reportage focal length in one twist of the barrel. Construction is solid as with all L series lenses of this calibre, and images are contrasty and clear. 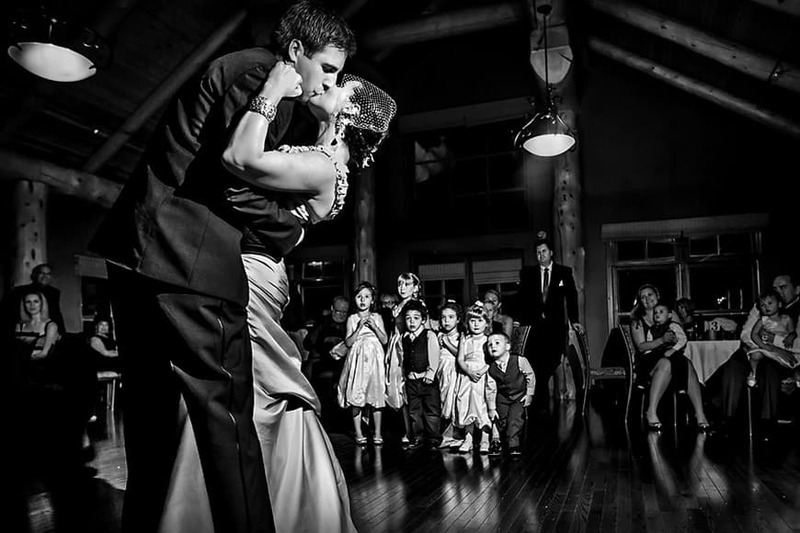 As for focusing, the Canon 16-35mm f/2.8 L II has fast and consistent autofocus, making it a popular choice for Canon wedding photographers wanting some crazy compositions on the dance floor. One thing to note is that if you’re a landscape or architecture photographer who uses filters, the Canon 16-35mm f/2.8 L II requires the larger 82mm format filter. The Canon 16-35mm f/2.8 L II has been a staple for many working pros for several years now and it’s easy to see why. 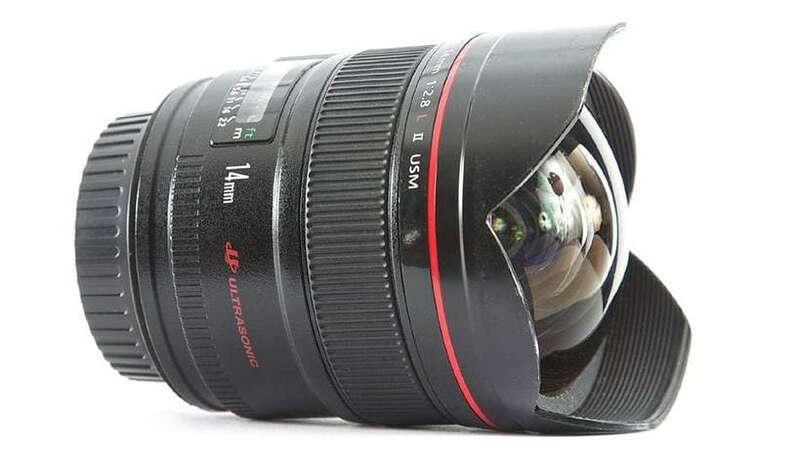 Solid construction, fast focusing, a versatile focal range and sharp image reproduction combines to create a lens that is for many zoom lens shooters the best wide angle lens for Canon cameras. 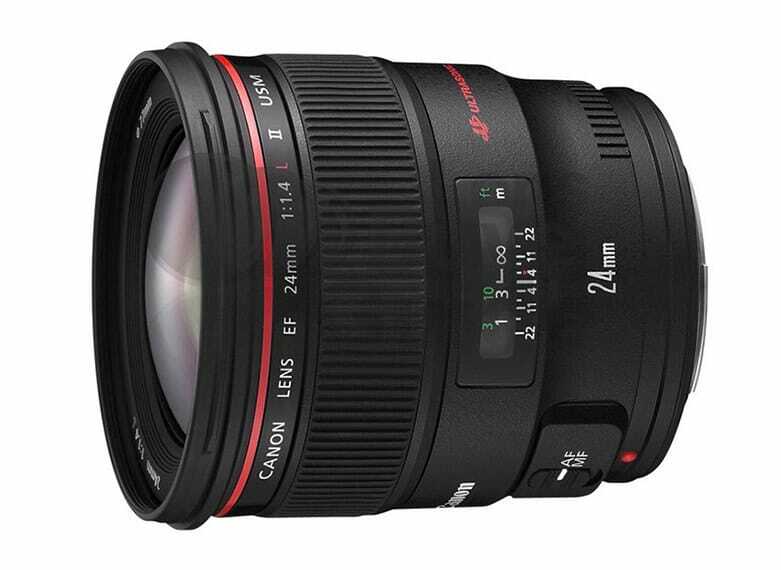 The Canon 24mm f/1.4L II is Canon’s best prime wide angle lens available today. It’s also Canon’s widest angle lens with an aperture greater than f/2.8. If you need a Canon wide angle lens that lets in as much light as possible, there really only is one option. For the average consumer, the price tag on the Canon 24mm f/1.4L II may seem expensive, but to the working pro, it’s a bargain – it’s also $500 cheaper than the Nikon equivalent. The version II of this incredible lens is slightly larger than its predecessor, but it’s still well balanced on a pro dSLR body. Contrast is also much better than the first version, especially in the centre of the frame at wide apertures. Thanks to the addition of an extra rounded aperture blade, the bokeh when shot wide open is more pleasing now too. You’ll have to be close to your subject with enough background distance to create the blurred background to appreciate this though. Although the Canon 24mm f/1.4L II isn’t particularly sharp wide open at f/1.4, stopping down to f/2.8 produces a razor sharp image. Corner sharpness is very good throughout and there is very little distortion, which is unusual for a wide angle lens. 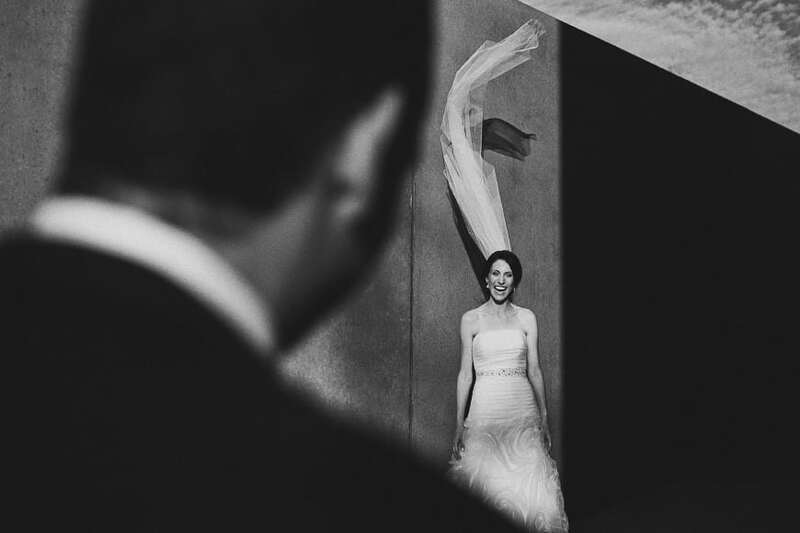 The Canon 24mm f/1.4L II is a hugely popular lens for photojournalists and wedding photographers, who often pair it with a 50mm or 85mm on another body. 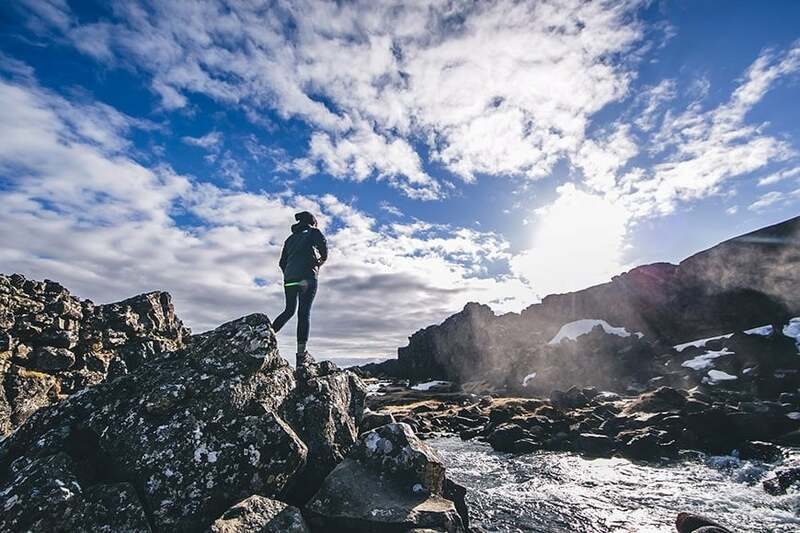 A 24mm wide angle lens allows the photographer to get close enough for a dramatic shot, whilst still including enough background to tell the story. 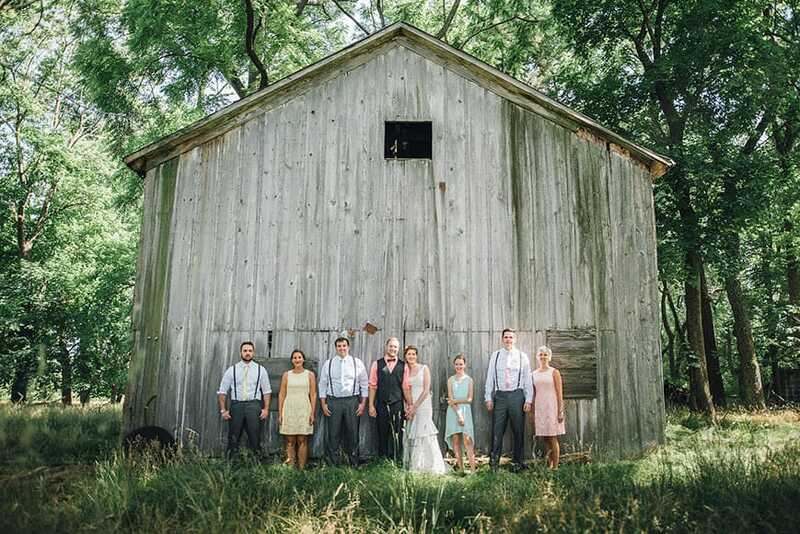 24mm is also a popular focal length to shoot group photos, but you’ll obviously have to stop down well away from f/1.4 to ensure all the members of the group are in pin sharp focus. 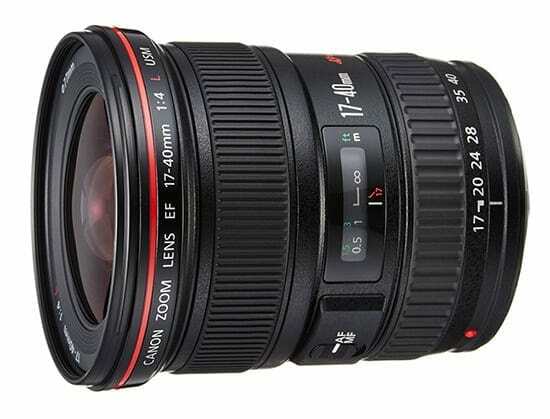 As with all Canon L series lenses, the Canon 24mm f/1.4L II is built like a tank to last a life time. Pro Canon lenses of this calibre hold their value very well, but don’t buy this lens if you’re thinking of selling it on in the future – once you have a go with it, it’s very hard to put down! The Canon 24mm f/1.4L II is quite simply the best 24mm Canon lens available, and some argue that it’s the best wide angle Canon lens ever. Not all great Canon wide angle lens options are priced for the professional, and this little 28mm offering proves the point well. At around $500, you can get a fast, lightweight Canon wide angle lens that offers great image quality and can slip in your jacket pocket as the perfect backup lens. The Canon 28mm f/1.8 USM is an older lens that doesn’t feature the coveted red ring of the L glass, but don’t let that put you off – it’s a surprisingly capable lens that can produce sharp, vivid images. Autofocus is fast and accurate and with a closest focusing distance of just 1 foot, you can create some engaging portraits by highlighting your subject and including enough background to tell the story. Distortion and other aberrations aren’t an issue for the Canon 28mm f/1.8 USM, which produces consistently clear, contrasty images even when shot wide open at f/1.8. Incidentally, unless you absolutely need an f/1.4 wide angle lens for its low light capabilities, I’d recommend you choose an f/1.8 or slower Canon wide angle lens. A larger aperture is beneficial for increased subject separation on longer lenses, but at wide angles, this separation is harder to achieve, and therefore less relevant. You can save a lot of money by buying a cheap Canon wide angle lens such as the Canon 28mm f/1.8 USM. 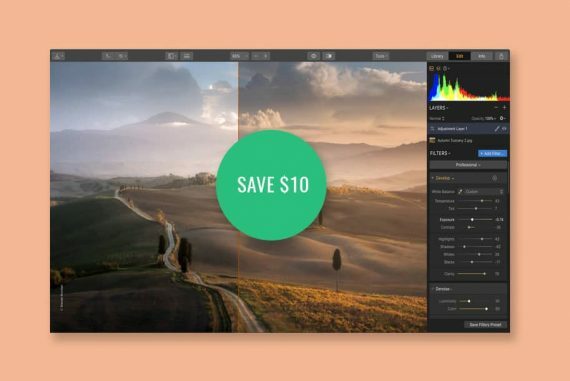 If you find yourself needing a little more light, take advantage of your camera’s higher ISOs instead. 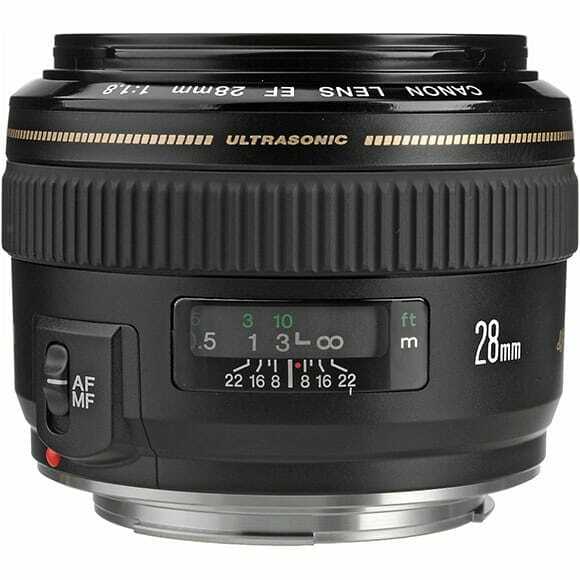 The Canon 28mm f/1.8 USM has over 200 positive customer reviews on Amazon and for good reason. It’s a cheap Canon wide angle lens that offers a highly useable perspective in a small, lightweight package that feels and looks great attached to your camera. 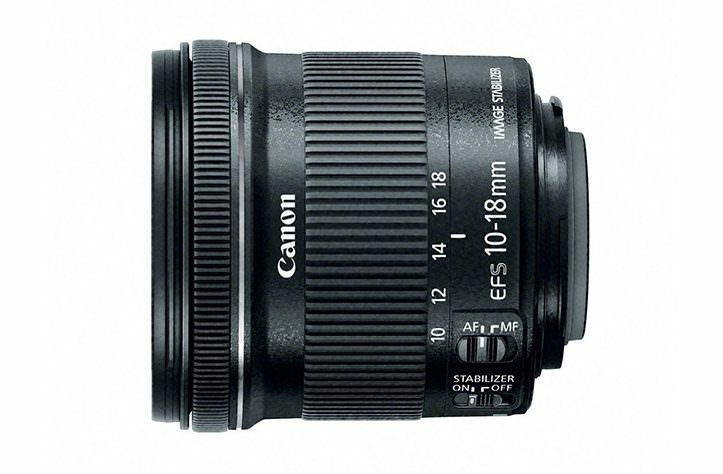 If you’re looking for a cheap wide angle lens for Canon APS-C dSLRs, look no further than the Canon 10-18mm f/4.5-5.6. Not only is this a cheap Canon wide angle lens, but it’s also remarkably good, and a real bargain for those wanting the wide angle look without the cost. 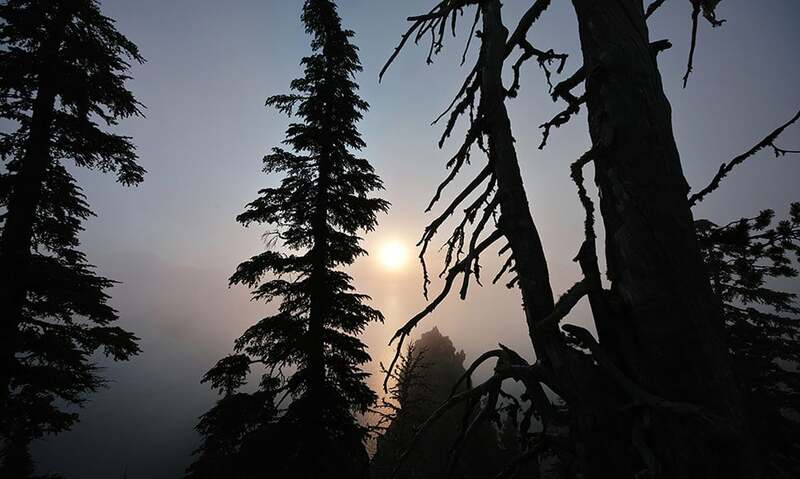 The Canon 10-18mm f/4.5-5.6 is lightweight, small, razor sharp and optically very impressive. It also adds Image Stabolization (IS), which is rare for a Canon wide angle lens. For this to be the cheapest wide angle lens for Canon, a few corners had to be cut in the build, which uses plastic in the place of metal. However, as long as you look after the Canon 10-18mm f/4.5-5.6 and keep it out of extreme weather conditions (since there’s no weather proofing), it’ll serve you well for many years. To achieve a truly wide angle perspective with a Canon APS-C dSLR, you need to select an ultra-wide wide angle lens such as this Canon 10-18mm f/4.5-5.6. The most surprising thing of all is that the Canon 10-18mm f/4.5-5.6 has little distortion throughout most of its range, except for moderately strong barrel distortion at 10mm and a bit of pincushion distortion at 16mm. Both these issues are quickly fixed with one click in Lightroom. Since this Canon wide angle lens is relatively slow (f/4.5-5.6), it is not intended for low light use. The Image Stabilisation works well for hand holding shots at slower shutter speeds, but don’t expect the Canon 10-18mm f/4.5-5.6 to excel when the sun goes down. If you’re a daylight photographer who needs a small, lightweight and cheap wide angle lens for Canon, the Canon 10-18mm f/4.5-5.6 is by far the best choice on the market. Although this Canon wide angle lens is slightly more expensive than the equivalent Nikon, it’s also much better, with significantly less distortion. 14mm is ultra wide angle lens territory, and this brings with it some challenges. If you want your subject to have any kind of presence in the frame whatsoever, you need to be prepared to get in very close. The Canon 14mm f/2.8L II is another big, heavy, expensive wide angle Canon lens, but those who use it regularly swear by it. 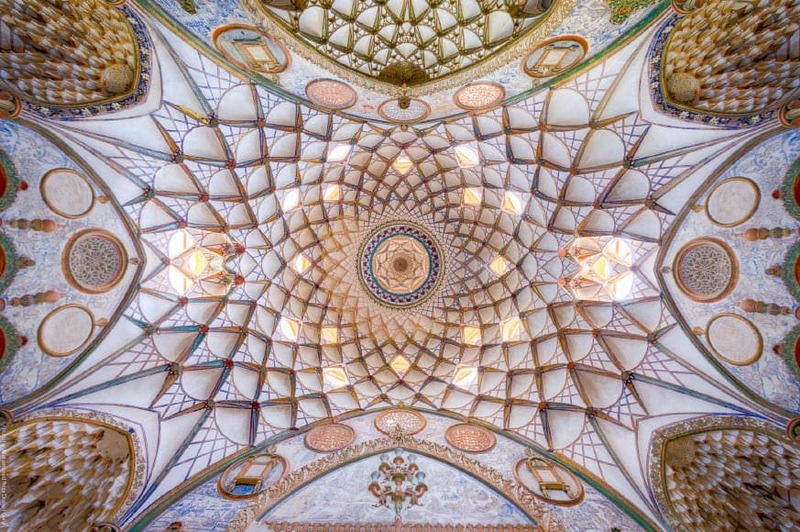 Architectural and landscape photographers often have the Canon 14mm f/2.8L II in their camera bags due to its unique ability to control the horizontal and vertical lines in a photograph, thanks to its rectilinear lens construction. For an ultra wide angle lens (indeed, Canon’s widest prime lens) to be able to produce images with no barrel distortion is incredible. I’ve heard stories of architectural photographers selling their tilt shift wide angle lens since the Canon 14mm f/2.8L II does such a good job at keeping lines straight. Images produced by the Canon 14mm f/2.8L II are tack sharp front to back and the colour/contrast is excellent. The difference between shooting at 14mm compared to 16mm of a 16-35mm wide angle lens for example may not seem much on paper but it’s actually a big deal. 14mm allows even the tightest of spaces to expand in front of you, making the Canon 14mm f/2.8L II a favourite for real estate photographers who need to make interiors look as spacious as possible. The bulbous front element and tulip shaped un-removeable hood make attaching regular filters to the Canon 14mm f/2.8L II impossible, so landscape photographers who love their long exposure daylight shots will struggle. However, for those of you who need the widest of wide angle Canon lenses with the very best performance, the Canon 14mm f/2.8L II is the best ultra wide angle lens available today. The Canon 17-40mm f/4L isn’t necessarily a cheap wide angle lens, but compared to some of the others on this list, it’s certainly a great bargain. If having a fast lens like the excellent Canon 16-35mm f/2.8L isn’t necessary for your type of photography(i.e. you always have enough daylight for a sharp shot), save your money and invest in the Canon 17-40mm f/4L instead. Not only your wallet, but also your back will thank you, since the Canon 17-40mm f/4L is lighter too, despite its solid build quality. 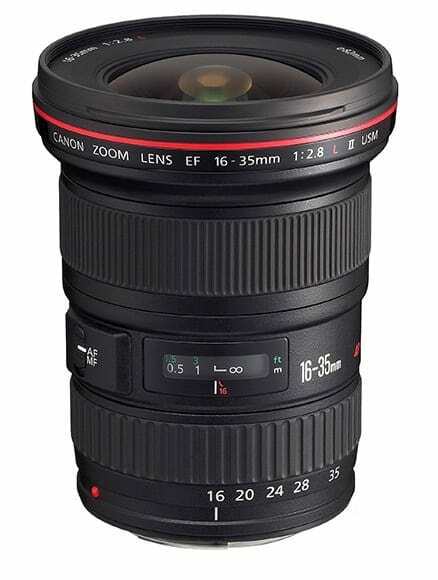 L glass usually mean heavy-weight, but this Canon wide angle lens is surprisingly light and small – in fact the Canon 17-40mm f/4L is the smallest/lightest L series wide angle Canon zoom lens available. Additionally, 17-40mm is the largest zoom ratio of any ultra wide angle Canon lens, giving you great versatility from a single, lightweight lens. Autofocus is fast and accurate, and sharpness, contrast and colour are all very impressive for this relatively cheap Canon wide angle lens – remember that you need to spend twice as much to get a lens of similar image quality, but just one stop faster. 17-40mm is actually a popular walkaround wide angle lens option for both hobbyists and professionals alike. 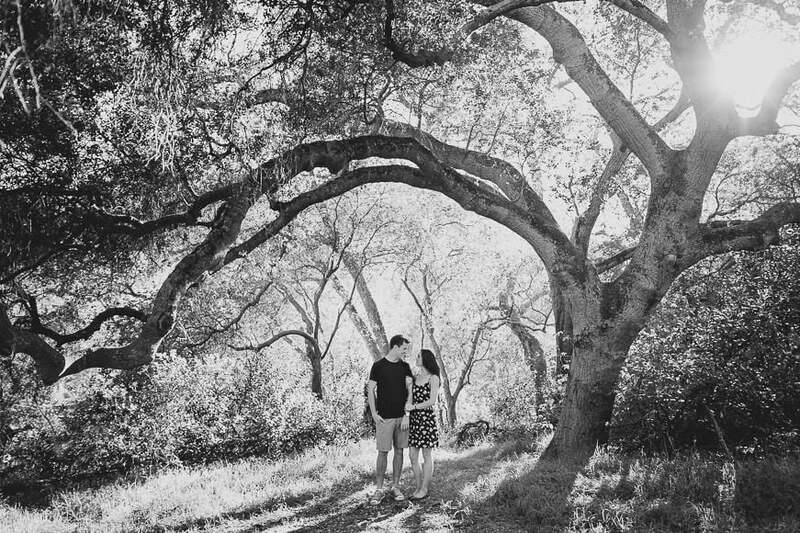 17mm can handle the tightest of spaces and 40mm isn’t bad even for portraits. f/4 won’t be creating any jaw-dropping bokeh, but subject separation isn’t a forte for wide angle lenses in general anyway. If you’re a daylight shooter looking for a cheap wide angle lens for Canon with a useful focal range, you only really need the Canon 17-40mm f/4L. Of course ‘cheap’ is relative, and the Canon 17-40mm f/4L may look expensive to some, but for Canon L glass optics, you’ll struggle to find a better deal than the excellent Canon 17-40mm f/4L. Even though this is a list of the best wide angle lenses for Nikon and Canon cameras, we shouldn’t forget about 3rd party manufacturer wide angle lenses that are compatible with both systems. It’s easy to turn your nose up at these cheaper (some may say inferior) offerings, but the truth is, there are some great lenses available at bargain prices. It’s often the case for both amateur and professional photographers that specialist ultra wide angle lenses are only used for certain shots, and spend the majority of the time tucked away in the camera bag. 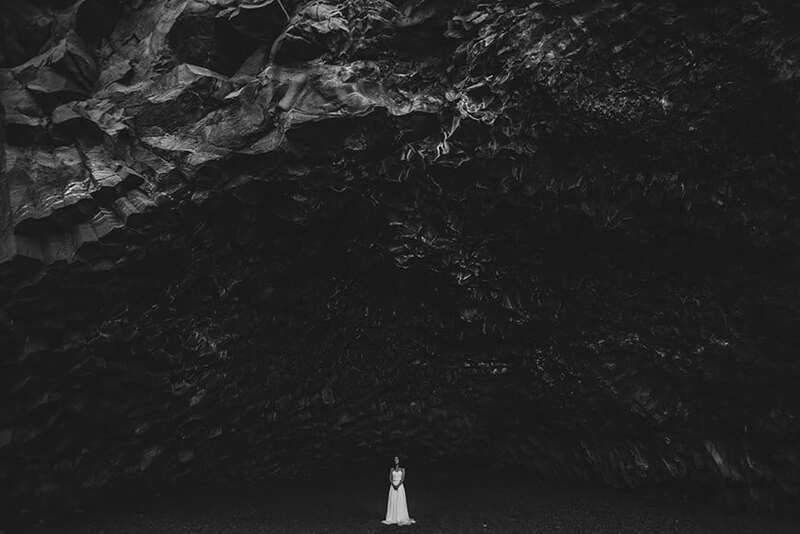 This is often true for wedding photographers who may need one ultra-wide angle just incase they need a shot of a large wedding group, for example. If this is the case, it’s arguably better to save some money by investing in a 3rd party branded wide angle lens, and spending the bigger bucks on lenses that you use much more. Whatever your usage case, here’s a selection of the best wide angle lens offerings made by 3rd party manufactures. Since its release in 2015, the Sigma 24mm f/1.4 ART has caused some huge ripples in the wide angle lens market. If there’s one wide angle lens that has caused photographers to sell their more expensive ‘big name brand’ lenses in favour of a cheaper third party alternative, this is it. At less than half the price of its Nikon and Canon equivalents, the Sigma 24mm f/1.4 ART is a comparatively cheap wide angle lens that simply excels. The debate is still out as to whether the Sigma is better than its big brothers, but it most certainly can hold its own against them. 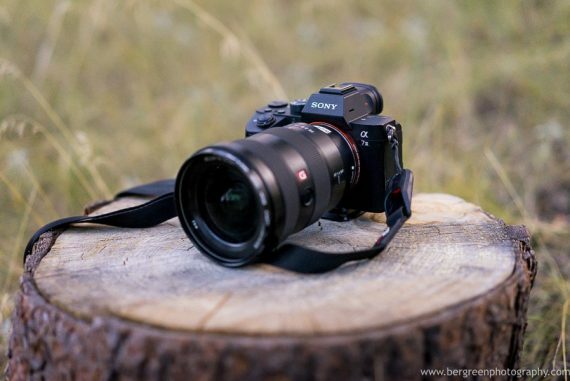 Excellent image optics top the list of the Sigma 24mm f/1.4 ART‘s accolades, with impressive sharpness, contrast, colour rendition and minimal distortion. You lose weather sealing when you drop to this price for a fast wide angle lens, but I’ve heard of users using a thick rubber band in the gap between the lens and the camera body to stop any splashes from enterting. If you have no plans to use the Sigma 24mm f/1.4 ART in adverse weather, this really isn’t an issue anyway. The ART series of Sigma lenses is hugely popular amongst amateur and professional photographers, and for good reason. Quality is top-notch and prices are affordable enough for most consumers to experience pro-level lens performance. Did I mention the Sigma 24mm f/1.4 ART is insanely sharp?! Arguably even sharper than the legendary Canon and Nikon 24mm equivalents, making this lens a favourite for all manner of photographer. If you’re thinking about stepping your toes into the wide angle waters and need a lens that can be used in low light, the Sigma 24mm f/1.4 ART really does deliver the best bang for the buck out of all the wide angle lens offerings. Amongst the third party wide angle lenses, this is the best wide angle lens available today. I chose to include the Tokina 11-16mm f/2.8 AT II in this list of the best wide angle lenses since it offers a fixed f/2.8 aperture throughout its zoom range, and all for under $500. It also has over 300 positive reviews on Amazon. If you want a cheap wide angle lens for your Nikon or Canon dSLR, the Tokina 11-16mm f/2.8 AT II is one of the best options available. As well as its fixed, fast aperture of f/2.8, it’s also sharp, well-built and a lot of fun to use. Distortion on a lens this wide is definitely noticeable, but easily corrected using a Lightroom import preset, or by checking one box in the Develop module. 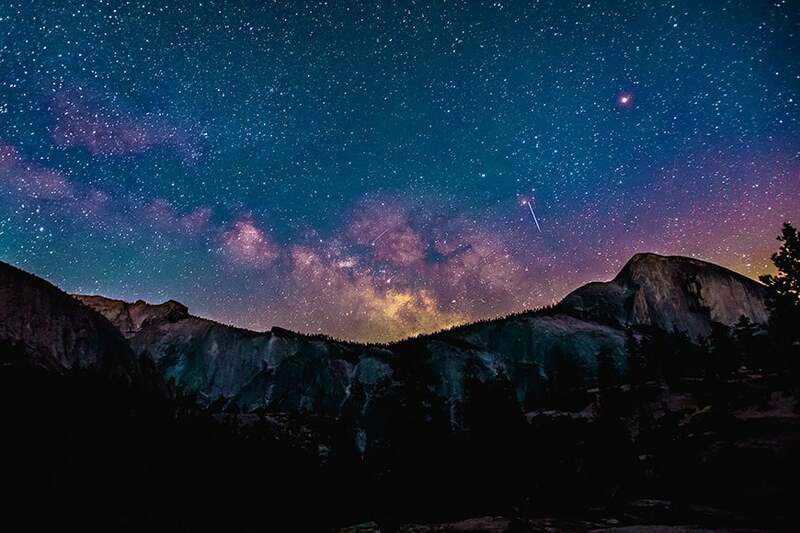 It’s a small trade-off for the incredible field of view you can get at 11mm. 11-16mm is obviously a very short focal range, but at least this range has been spread out on the zoom ring, making it easy to set a precise composition with the Tokina 11-16mm f/2.8 AT II. A fun aspect of the Tokina 11-16mm f/2.8 AT II is that you can focus as close as 12″, which can result in some hilarious distortions, especially if your subject is off-centre. The best part about this lens is that it has an internal autofocus motor, meaning that is can autofocus even on Nikon’s cheapest dSLRs. Normally lenses which feature an inbuilt motor are more expensive, but Tokina has managed to make the Tokina 11-16mm f/2.8 AT II the cheapest ultra wide zoom available for Nikon cameras. 3rd party lenses are usually poorer built than their big name counterparts, but this isn’t the case with the Tokina 11-16mm f/2.8 AT II. It’s still made of plastic, but the construction is much stronger than the Nikons in this price range. If you’re looking for an affordable zoom wide angle lens with a fast, fixed aperture for your Nikon DX dSlr, the Tokina 11-16mm f/2.8 AT II really is hard to beat. Just check out the hundreds of positive reviews on Amazon – this is a hugely popular lens, and deserves its place in this best wide angle lenses roundup. 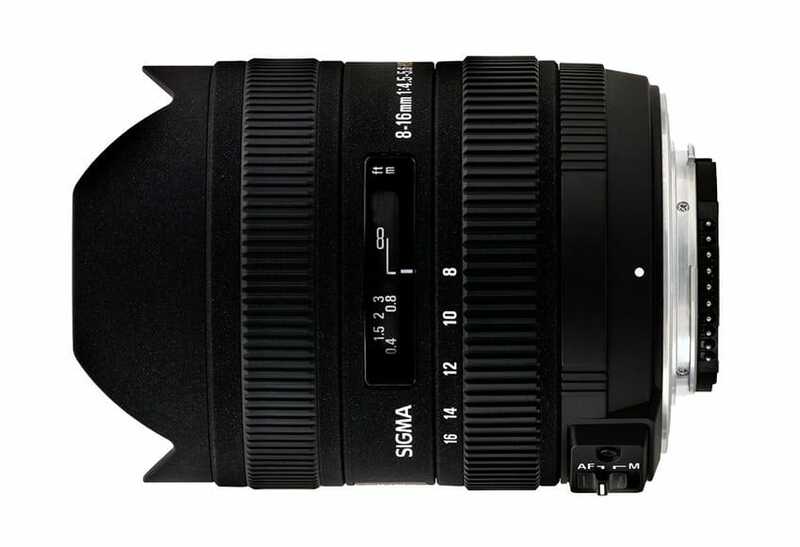 This excellent Sigma wide angle lens is compatible with Canon, Nikon, Pentax, Sony and of course Sigma dSLR cameras. This means that pretty much any dSLR camera owner can take advantage of this impressive and immensely popular ultra wide angle lens at an affordable price point. The Sigma 8-16mm f/4.5-5.6 DC is consistently named as one of the best wide angle lenses for crop sensor cameras under a thousand dollars. In fact, you’ll get a lot of change from a grand, with Amazon currently selling it for $699 with free shipping. So where does this cost-saving occur exactly? Well, as with most third party lenses, build quality and mechanics are not quite on par with the big name brands. The Sigma 8-16mm f/4.5-5.6 DC has decent auto focus, but it can’t quite keep up with the Nikon and Canon equivalent wide angle lenses. 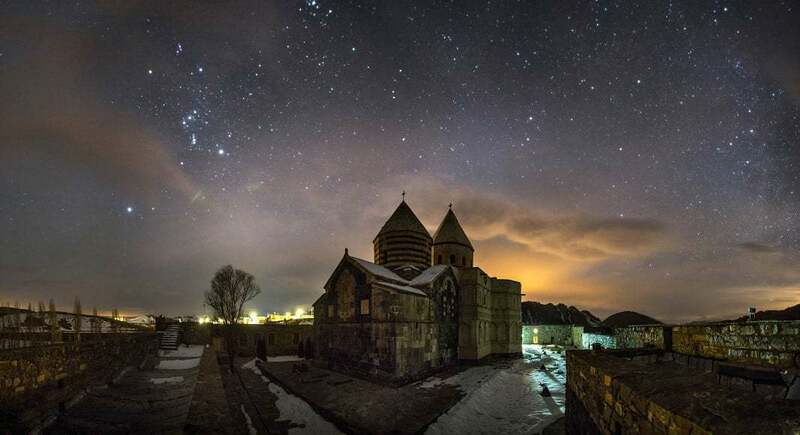 However, most ultra wide angle lens shooters aren’t interested in using them to capture fast moving action – this territory is more for landscape, architecture, interior, astrophotography and other semi-static subjects. You can use the Sigma 8-16mm f/4.5-5.6 DC on a full frame camera but I wouldn’t recommend it since vignetting is too strong. On a crop sensor body, the focal length is equivalent to a 12-24mm, and performance is very good. Its moderate weight also means that smaller bodies won’t feel too unbalanced. For such a wide angle lens, the Sigma 8-16mm f/4.5-5.6 DC is impressively sharp, especially when shot wide open at f/4.5. Most users will no doubt be shooting wide open at 8mm, and centre-sharpness, contrast and colour are all excellent. It’s only in the edges that softness is apparent, but for most photographers, this won’t be an issue. Distortion is prevalent in almost all ultra wide angle lenses, and the Sigma 8-16mm f/4.5-5.6 DC is no different. However, Lightroom corrects this with one click – I’d recommend you add the lens correction to your import preset to apply it automatically upon image import. If you need an ultra wide angle lens for your APS-C camera, there isn’t really much choice other than the Sigma 8-16mm f/4.5-5.6 DC… so lucky it’s a great performer! Just shoot it wide open at f/4.5 and you’ll be happy with your decision. 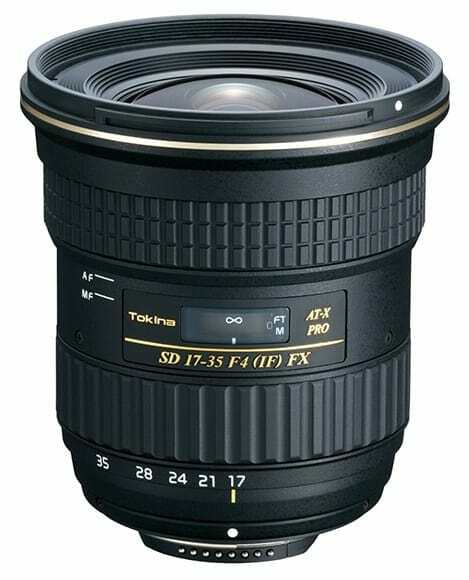 The Tokina 17-35mm f/4 is designed for Nikon and Canon full frame cameras but can also be used on crop sensor bodies. Offering a 2x zoom at a moderately wide angle zoom range, it’s one of a few different wide angle lenses that Tokina produces. Build quality is surprisingly good for a cheap wide angle lens, with a metal (as opposed to plastic) lens mount and solid casing that should stand a few knocks and bumps. The first time I examined files from the Tokina 17-35mm f/4, I was quite impressed. Whilst the quality wasn’t on par with the big name brands, the image quality was much better than you’d expect from such a lightweight, cheap wide angle lens. 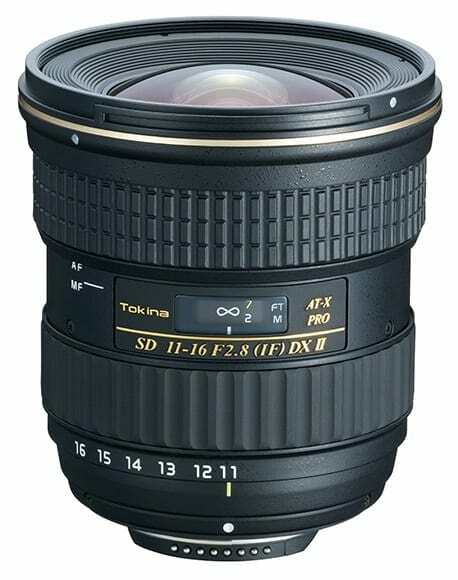 The focal length of the Tokina 17-35mm f/4 is perfect for most people looking for an ultra wide – wide angle lens. 17mm allows you to get a lot in the frame, whilst 35mm has been the preferred choice for many a photojournalist over the years. However, if you shoot a lot in well-lit venues or outdoors during daylight hours, the Tokina 17-35mm f/4 is a very capable lens. Sharp in the centre, it becomes slightly less sharp towards the edges, but this is only noticeable upon closer examination. Based on many users’ opinions, the Tokina 17-35mm f/4 seems to be sharpest when stopped down to f/5.6. Distortion levels are also impressive, with less distortion at 17mm than the Nikon equivalent lens, which is far more expensive. The Tokina 17-35mm f/4 takes regular 77mm filters, making it a great wide angle lens for landscape photographers wishing to shoot long exposure photos in daylight (e.g. waterfalls with ‘flowing’ water or landscape shots with cloud movement). im a Nikon D7200 owner.. I am confused. I have the Nikon d7500 camera. And per the advice in this article regarding the best wide angle lens for this crop sensor camera bought the Nikkor 10-20mm f4.5-5.6G VR lens. However in the instructions for this lens it says that this lens is not supported on Nikon series 7000 cameras. Am I missing something? Clarification would be greatly appreciated. Hi Ernest, that’s odd – did you get it working? spend the extra cash and get the tokina 11-20 f2.8 (nikon mount)…… way better for lower light… sure you miss out on the wide end by 1mm and i know that could be a deal breaker for some… check my comment above to see the wide lenses i own…. 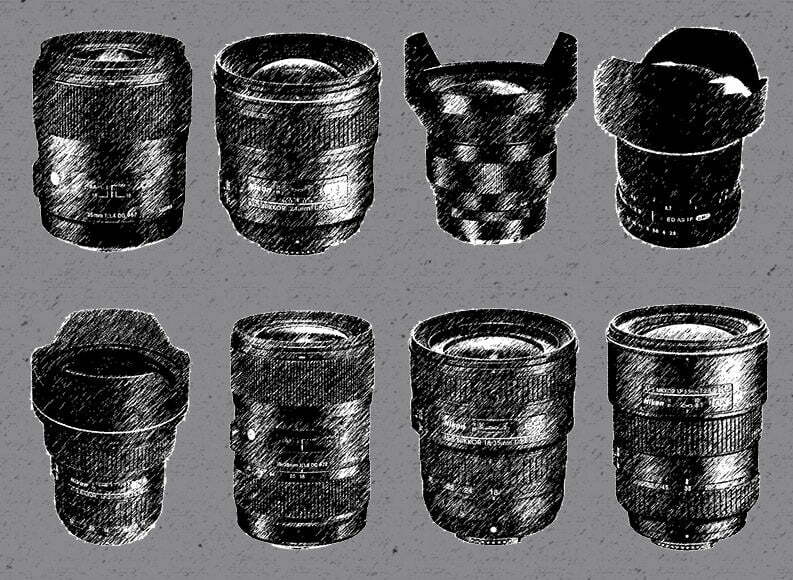 Thanks for the feedback, Damian – you’ve got quite the arsenal of lenses there! What do you normally shoot? What do you think about Samyang 14 Sp f2.4? What about the Canon EF 24mm f./2.8 IS USM for a first wide angle lens? I do a lot of landscape and architecture photography and I am really excited about trying out a wide angle lens. So far my research has led me to this one and I wanted to know what everyone else thought of it. Hey Mark, just thought I’d point out that you called the Canon 16-35 2.8 II a 17-35 at one point :) thanks for a great article! One big mistake has been made in text. Nikkor 14-24 f2.8 is amazing lens for landscape photographers and there are quite a few producers that make ND, Polariser and LongExposure filters (big, small stoppers). Just to name a few: Lee Filters SW150, Haida, Formatt Hitech. So yes, if you have a special filter holder, you can use that lens like any other lens in terms of filters. It is heavy and you need a good tripod head, but it gives you amazing perspective and creative space to grow. 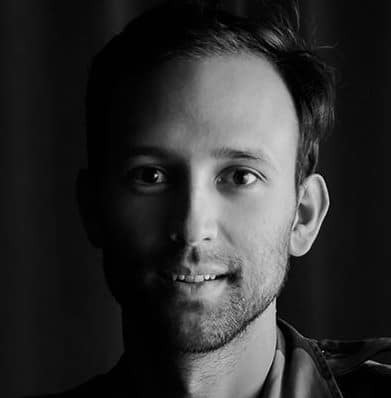 Regarding most of f4.0 wide angle lenses. They are quick enough and will work just fine in any lighting condition, including low light. If you introduce VR to it, with normal ISO settings you will be able to do any kind of shoot. Thank you very much for this article, Mark! Helped a lot! But I was wondering why no mention was made for the Canon 11-24 mm? Also no mention of the Zeiss lenses.. perhaps too expansive? Thanks Frederic. Yeah, I consider the Zeiss glass a little pricey for most people. The 11-24mm is another good lens which I did think about including, but the bulbous front element (which prevents filters from easily being added) and heavy weight make it a little too cumbersome for most users. Great article. Would be of great helpz if you could mention good wide angle fit for E mount cameras. I can’t take this article seriously. The stats for each lens go back and forth between listing weights in grams or pounds. So either you don’t want us to be able to compare stats, or you’re just carelessly pasting boilerplate. Seriously, I’m looking for a good landscape lens to use while backpacking, and weight is a major issue. But this article fails in helping me out. I haven’t used that lens Carlos, but will check it out when I get a chance and see if it’s worthy of being added here! 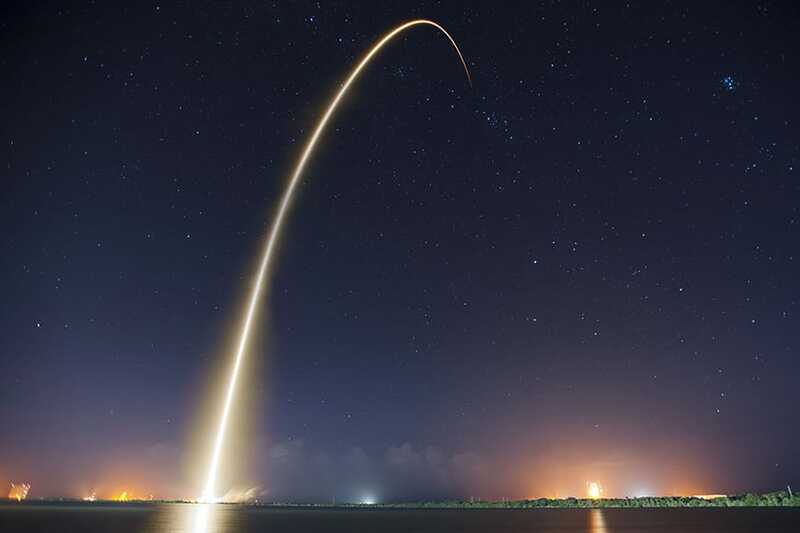 This is a great article, packed with detailed information and great examples. Thanks Mark, glad you enjoyed it. Great information regarding wide angle camera lens.It helps me in choosing Canon 10-18mm f/4.5-5.6 IS camera lens. 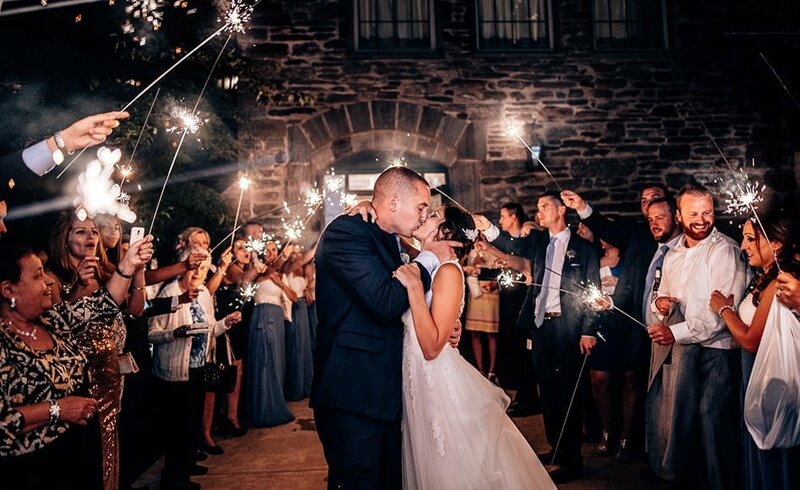 I use the Canon 16-35mm f2.8 a lot during wedding receptions. It’s a must have for all wedding photographers! I have a Canon EF 20mm f2.8 lens, while I do like it, I was hoping to love it like I did my Nikon 20mm f2.8 that I had when I used to shoot with Nikon film cameras. It’s not giving me the same wow factor that I was hoping for….I need to let it go. It’s not the lens, my dear, that provides the “Wow” factor. It’s the skill of the photographer. That’s very true. However, even a good workman can benefit from good tools! Whoa, this is a massive list – and with examples! You really worked hard on it, thanks. I should definitely take out my wide lenses more often, and perhaps order a new one. Def bookmarking this. Glad you found it interesting Alex. I’ll be updating it with more examples soon too.